All WordCamp organizing teams are asked to keep their event budget in their WordCamp dashboard (Budget>Budget). In the US and Canada, WordCamps use the financial backing of the company called WordPress Community Support, PBC (a subsidiary of the WordPress Foundation) to manage the money involved with their event. Outside the US and Canada, we offer the use of WPCS as a legal and financial entity to organizers if they wish to take advantage of it. How does this work? #How does this work? Once a WordCamp budget has been approved by a community deputy, there is no need for a WordCamp to raise a certain amount of money before submitting invoices to pay venue deposits or other up-front expenses. Each WordCamp budget is kept up to date in the WordCamp dashboard, and sponsor invoices and vendor payments are managed through the tools on each WordCamp site dashboard. Surplus funds from WordCamps are retained by WordPress Community Support for the support of other official WordPress community events and programs, including local meetup and user group events. 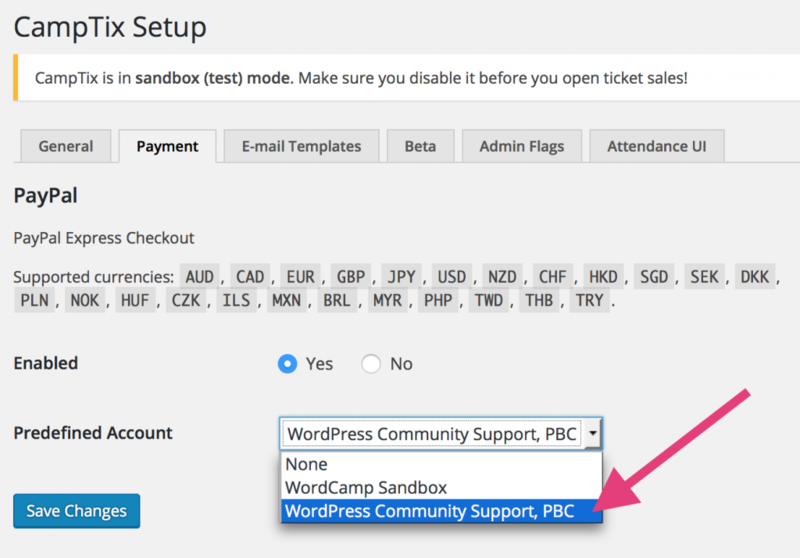 WordPress Community Support, PBC is a subsidiary of the WordPress Foundation, and the purpose of WPCS is not to make a profit, but rather to benefit WordPress community programs. However, the PBC is taxed as a for-profit corporation by the IRS. More details here. This means most WordCamps and meetups will no longer be able to take advantage of most non-profit discounts from vendors. As soon as you get a new sponsor, add their information to your WordCamp website and save the sponsor listing to Draft. Important! For amounts under $250 USD or equivalent, please create a microsponsor ticket instead, to reduce our administrative burden. When a payment comes in, WordCamp Central will mark that sponsor as paid using the Sponsor Invoices tool and you’ll receive an email that it’s time to add that sponsor to your website. Publish the Sponsor listing (which you left in Draft mode, while waiting for payment) to add them to your site. Take CampTix out of sandbox. Ticket revenue goes to the WordPress Community Support, PBC Paypal account. Once your budget is approved, please keep it updated. When vendors are chosen, please add each one into Vendor Payments on your WordCamp site’s dashboard and save them to draft. When you get a vendor invoice, fill in the details to Vendor Payments, attach the invoice, and submit for payment when ready. Please name your request something with something that indicates what payment is for, for example “WordCamp NYC Speaker Social” or “WCYVR swag.” Please note: Your payment request will not be submitted to WordCamp Central when it is in draft. Before you submit the request for payment, please be certain you have the required payment details. Before we pay it, we’ll check the invoice against the current shared budget document. Warning! If the invoice amount doesn’t match your budget, the payment will be delayed while we figure out what’s going on. If the vendor sends you a receipt, please upload it to the original payment request. When we pay your vendor we will mark the payment request paid and record the payment date. In the case of last-minute or cash-only expenses, organizing teams pay those out of pocket and submit for reimbursement. Warning! Reimbursement via check is the slowest payment method available: checks are sent in a minimum of 5 days. Reimbursement via direct deposit is the fastest way we send money in the US. We reimburse by wire to bank accounts outside the US.